Our bodies need to stay healthy dietary fibers, as a result of lack of fiber can cause a variety of health risks ranging from digestive problems to cancer risk. Therefore, it is important to consume enough fiber every day that is 20 to 25 grams of fiber per day. How to meet the needs of fiber? Perhaps many who know that high-fiber foods are fruits, vegetables, nuts and seeds. Characteristic of high-fiber foods are low in calories, high in vitamins and minerals. Although the food is less tasty compared to meat and fish, but it can prevent diseases caused less fiber as will be explained below. Often eat foods lacking in fiber but high in fat increases the risk of constipation (constipation), diverticular disease and hemorrhoids. Keep in mind there are two types of fiber in the diet, the soluble and insoluble fiber. Both are beneficial for the body, it makes without being digested. Insoluble fiber has an important role in keeping the intestine in order to function properly. This would make a bowel movement to be smooth and may reduce the risk of colon cancer. 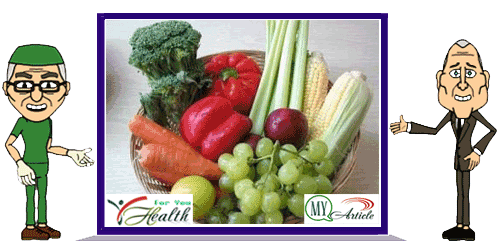 Sources of insoluble fiber are well include wheat and wheat flour, mostly vegetables and nuts. Due to lack of fiber in the diet, there will be increased levels of total and LDL cholesterol in the blood significantly increases the risk of artery disease, such as coronary heart disease and stroke. In fact, soluble fiber, found in foods such as citrus fruits, pears, beans and wheat, will bind LDL cholesterol in the channel so little is absorbed by the body thereby helping to lower bad cholesterol levels. In addition, the fiber also has a major influence on a person's blood pressure. Some studies suggest that high fiber intake can lower blood pressure, both systolic and diastolic. Did you know that fiber helps to increase satiety and vice versa when the shortage then someone will eat more often and exaggerated. Why? Because high-fiber foods generally require more time to digest than refined carbohydrates or sugars. That is why one due to lack of fiber in the diet is overweight or obese. So, for those who want to lose weight do not forget to eat foods that are high in fiber. Low-fiber foods, refined carbohydrates, like white bread and sugary foods, will be digested quickly, causing the rise in blood sugar. Meanwhile, high-fiber foods can slow the absorption of sugar consumed at the same time. Thus, the levels of blood sugar will be more stable. It is also supported by studies showing that dietary fiber may reduce the risk of type 2 diabetes or diabetes. As was mentioned earlier, digestive problems due to lack of fiber include colon cancer and gastric cancer. Populations with high fiber intake had a lower incidence of disease colon cancer. One theory suggests that fiber may prevent the adverse effects of toxins on the intestinal cells, by means throw it out of the body before the toxins do damage because fibrous foods will smooth bowel movement. Fiber also has the ability to absorb bile acids and other possible irritants that can affect the lining of the intestine and cause the development of cancer. In addition to gastrointestinal cancer, preliminary studies show that consumption of fiber shown to be beneficial in preventing breast cancer. How can it be? Because fiber can bind to estrogen excess and toxins coming from the gastrointestinal tract.